Ann Arbor – A new awareness campaign to support ALS patient care and research picks up right where the Ice Bucket Challenge left off: On ice. 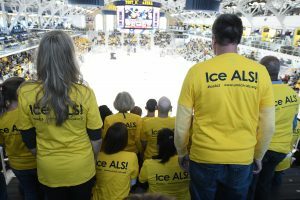 With fans chanting “Ice ALS,” Michigan’s hockey, research and clinic teams, along with the ALS Association’s Michigan Chapter, all came together on October 8 to defeat a common opponent: amyotrophic lateral sclerosis, also known as Lou Gehrig’s disease or ALS. The event, held at Yost Ice Arena, was part of the University of Michigan’s 4-0 hockey victory over Union College. 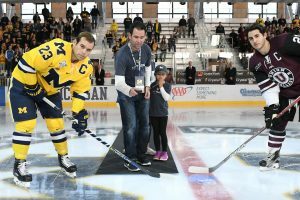 It included former Michigan hockey player Scott Matzka, as well as Joe Feudi, whose wife Jill is the business operations manager for Yost Arena. Families of both Matzka and Feudi participated; Matzka dropped the ceremonial first puck to start the game. Both men are ALS patients. The event was also attended by PNR&D Director Eva L. Feldman, MD, PhD, an eminent ALS researcher; Stephen A. Goutman, MD, Director of the U-M’s Comprehensive ALS Clinic; and Paula Morning, Executive Director of the ALS Association’s Michigan Chapter, all of whom wore #IceALS t-shirts. The event was designed to raise awareness of ALS, a degenerative disease that causes nerve cells to die. ALS patients first experience weakness in their muscles, but eventually lose their ability to eat and breathe. There is no known cure. The University of Michigan’s ALS Clinic provides multidisciplinary care for ALS patients that includes respiratory, physical and occupational therapy to help patients live independently for as long as possible; nutritionists to keep them strong; a social worker to help families identify and secure needed resources; and even a wheelchair specialist. See the related U-M Health blog here.